Susan Feldman, violinist and active teacher in Los Angeles and performer throughout the United States, has devoted much of her professional career to the study of historically informed performance on period instruments from the Middle Ages through the Baroque. 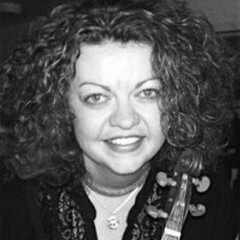 Susan Feldman, violinist, is an active teacher in Los Angeles and performer throughout the United States. Susan holds a Bachelor’s degree from Illinois Wesleyan University, a Master’s degree from the University of Southern California, where she studied with Robert Lipsett, and a Doctorate from USC in early music performance where she studied with James Tyler, Ingrid Matthews and Elizabeth Blumenstock. She has devoted much of her professional career to the study of historically informed performance on period instruments from the Middle Ages through the Baroque. In 1999, Susan co-founded La Monica, a period instrument chamber ensemble dedicated to performing music of the Baroque period. Susan has played with Baroque Band in Chicago, Seattle Baroque, Los Angeles Baroque and Musica Angelica. She is an active and founding member of Tesserae, a Los Angeles-based early music group dedicated to performing music from the early baroque, and an active member of Bach Collegium San Diego. Susan is currently on the early music faculty at USC, where she coaches the Thornton Baroque Sinfonia and teaches private students. She also recently joined the teaching team at the Bergmann Project, a part of the Santa Monica/Malibu School District, serving the city’s underprivileged families.